The Encore! 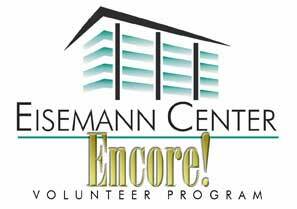 Volunteer Program at the Eisemann Center for Performing Arts is a great way to support your community, build friendships and experience world-renowned entertainment. If you love music, dance or theater, then the Encore! Volunteer Program would be the right fit for you. No experience is necessary to join this fun and close-knit family. Potential volunteers need only have an interest in the performing arts and enthusiasm for working with patrons in a welcoming and respectful manner. Volunteers age 16 and up may serve as Greeters, Ushers and Ticket Takers. Current volunteers represent a wide range of ages, including high school and college students, families, middle-aged working singles, couples and those in their second act who are especially helpful working weekday events. Benefits include the opportunity to earn tickets to shows, an annual volunteer appreciation dinner and behind the scenes experiences. Schedules are flexible as the Eisemann Center hosts many events each month. There are no assigned shifts. Each volunteer chooses the events that work with their personal schedule. Volunteers are needed for matinee and evening shows such as symphonies, ballet performances, corporate events, cultural celebrations, performances for schools, special events such as the Miss Texas Pageant, musicals and dramatic theater. An online database allows for easy event sign up on a first-come, first-served basis. Volunteers are expected to work at least two events per month and make a commitment of at least six months. Orientation and training are provided. To fill out the application and become a member of this exciting team, please click here. Email questions to volunteer.eisemann@cor.gov or call 972.744.4668. Assignment positions vary to provide volunteers with diverse experiences. Due to the requirements of their duties, volunteers will not always be able to see the performances they are working. Ushering positions will be rotated on a regular basis to provide all Eisemann Volunteers with the same opportunities.